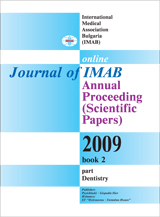 The sufficiency of attached gingival (AG) around teeth and fixed restorations is a sign for absence of local traumatic factors from dental or soft-tissue origin. Nevertheless the supporters are natural teeth or implants, the attached gingiva around the restoration is a guarantee for long-term, aesthetic and functional prosthetic restorations. This refers particularly to the attached gingival around the implants –periimplantitis develops quickly due to its absence. Different techniques can be used for implants’ second stage surgery time – uncovering with puncher, with ceramic bur, with electrosurgery , with partial thickness flap, with partial thickness flap and inserted connective tissue graft, with partial thickness flap and free epithelial-connective tissue graft. Key words: attached gingival, periimplantitis, connective-tissue graft.